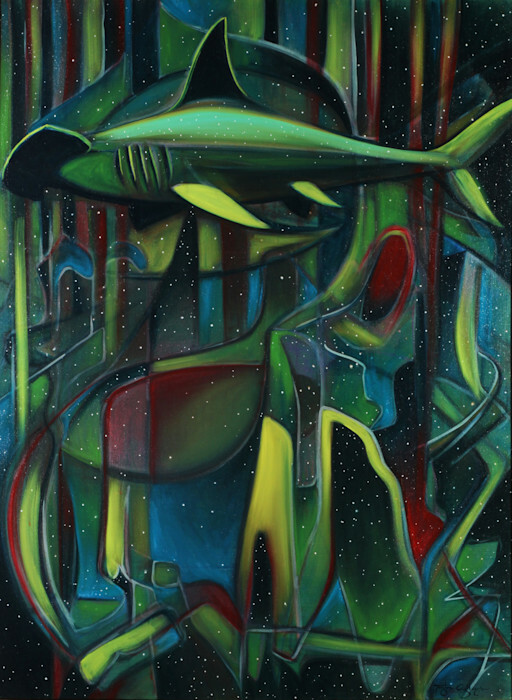 "Hammerhead," oil on canvas, 48 x 36, 2016. Hammerhead sharks have always fascinated me. I think we all share this wonder about these hunters from the deep. Their strangely shaped heads and the way they travel in huge groups, keeps this mystery and wonder about them. They would be scary if they were hunting you, but really they are just a part of the natural order of the world. They are part of the balance. Abstracted "Hammerhead" painting as fine art reproduction or original artwork by Southern California Artist, Taylor Gallegos.